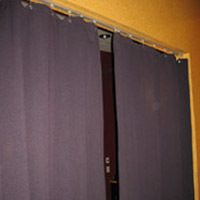 Brite Inc. has Flame Retardant Blackout Curtains for any application. Perfect for Laboratories, Classrooms, Audio Visual applications and Backdrops, our Blackout Curtains block out all light, regulate your indoor temperature, trim the fat from your energy bill, stay secure and come off easily via Velcro. Choose a custom size and control sound, light and temperature with this single comprehensive solution.